There are many images of King William Street, as it was one of the busiest thoroughfares. The Town Hall was (still is) there, the Cotton Exchange, the Market Hall, part of the 'open' Market, as well as all the shops on the left, plus many other properties, which were behind the photographer in this view. Although there are many photos of K.W. 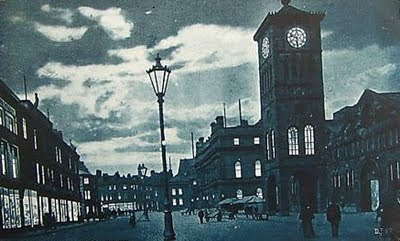 Street, this is the only one I know of, from this period (c1900) taken at night. It's a lovely photo. I hope you agree. I notice that the statue is there on top of what is now Marks and Spencers. Who was it of? Hi Napman. I believe the statue is of one of the Peel family, probably Robert Peel (the younger), politician and founder of what became the modern police force. That section of K. W. Street was known as the Peel Buildings. The section that corners Town Hall Street, further along the same block were known as the Albert Buildings.